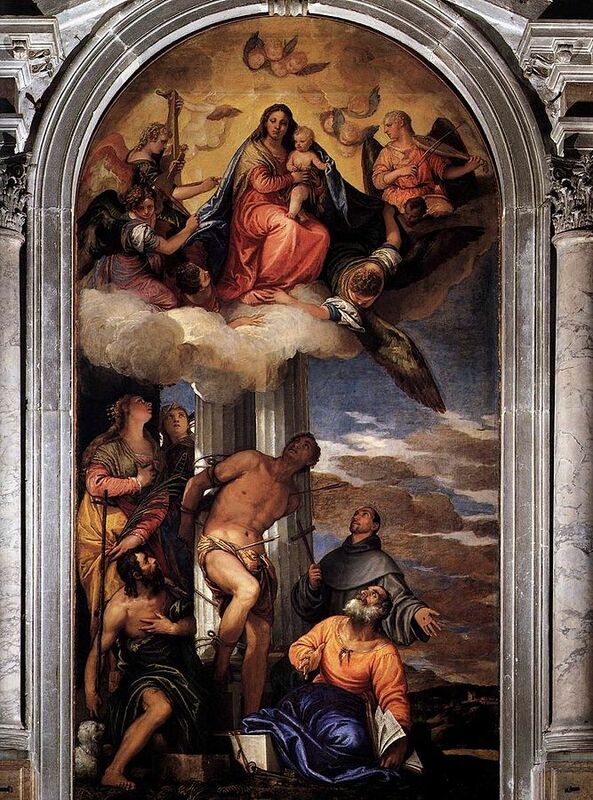 Veronese enjoyed the patronage of both religious and secular patrons including the Doge of Venice and noble families such as the Gonzaga’s of Mantua and the Giustiniani’s of Genoa. Among his most famous Venetian commissions are the interior of San Sebastiano, and interior decorations of the Marciana library and the Ducal Palace. He is probably most well-known for his large biblical and mythical canvases, notably The Wedding at Cana (1562-63) and The Feast in the House of Levi (1573) which famously lead to his interrogation by the Inquisition. The painting was originally of the Last Supper, but Veronese had chosen to add dwarfs, soldiers and animals to the scene. He was tried for heresy, stating in his own defence that “We painters use the same licence as poets and madmen.” Subsequently he changed the subject matter. Despite this dangerous entanglement he was one of the leading painters of the 16th century. Luminous tonality and harmonious beauty are characteristics of Veronese’s works, and his legacy endured through artists such as the Carracci, Rubens and Tiepolo. 17th century Venetian artist and writer Marco Boschini said of Veronese that “He is the treasurer of the art and of the colours. This is not painting, it is magic that casts a spell on people who see it.” However he is not just about pomp and pretty colours; he mastered foreshortening (as seen in his ceiling paintings), was an exquisite draughtsman who prepared thoroughly for his work by drawing and was able to paint portraits with a sense of gravity and sincerity. His biographer Claudio Ridolfi put it better, saying that that Veronese never put his brush in the wrong place. Compositionally he often favoured the use of architectural settings, a format which stages his subjects with dramatic effect. The use of sumptuous and rich dress adds further to this, seen in such masterpieces as The Family of Darius before Alexander (1565-67). Upon his death in 1588 Ridolfi said that he had been summoned to heaven to paint.